Great scientific discoveries aren’t always born in hi-tech laboratories. Many discoveries were made in unexpected places using everyday materials. The next great scientific discovery could be made in your home. Here are some home-based D.I.Y. science experiments to get you started on your journey of discovery. No fancy or expensive equipment needed. 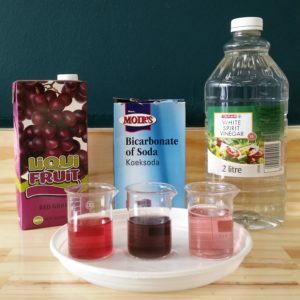 Enjoy home-based science experiment using everyday home items! Please perform all experiments with adult supervision. Place the glass cup in the centre of a tray. Pour about a ¼ cup of grape juice into the glass with an equal amount of water. Add ½ a spoon of bicarbonate of soda. Stir well. Do you notice any change? Now add ½ cup of vinegar. Stir well. The grape juice, with the water added, has a reddish-pink colour (see glass 1 in photograph). When the bicarbonate of soda was added, which is a weak base, the grape juice change a dark, almost black colour (see glass 2 in photograph). When vinegar, which is a weak acid, the coloured reverted back to pink (see glass 3 in the photograph). The grape juice is acting as an indicator which is pink in an acidic solution and black in a basic solution.